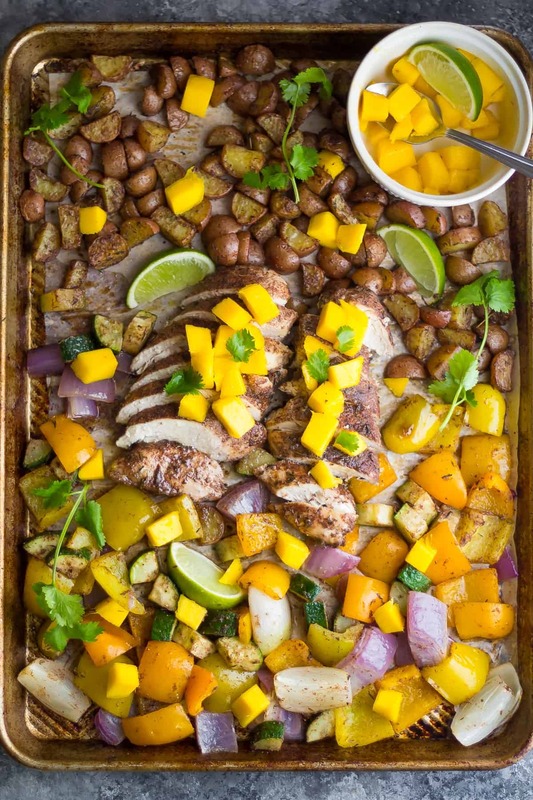 This healthy Jamaican chicken sheet pan dinner bakes up with bell peppers, onions and potatoes in a spicy Jamaican spice rub in under 30 minutes. Top with fresh mango! Interrupting the parade of peppermint, gingerbread and all things holidays to bring you this delicious Jamaican chicken sheet pan dinner! I do love the holidays, I really do! But the 24/7 non-stop flow of holiday treats on Facebook wears me out a bit. And sometimes I get an identity crisis, like when I forget that I’m Canadian and Thanksgiving happened months ago, and no, I don’t get Thursday off work to eat turkey. 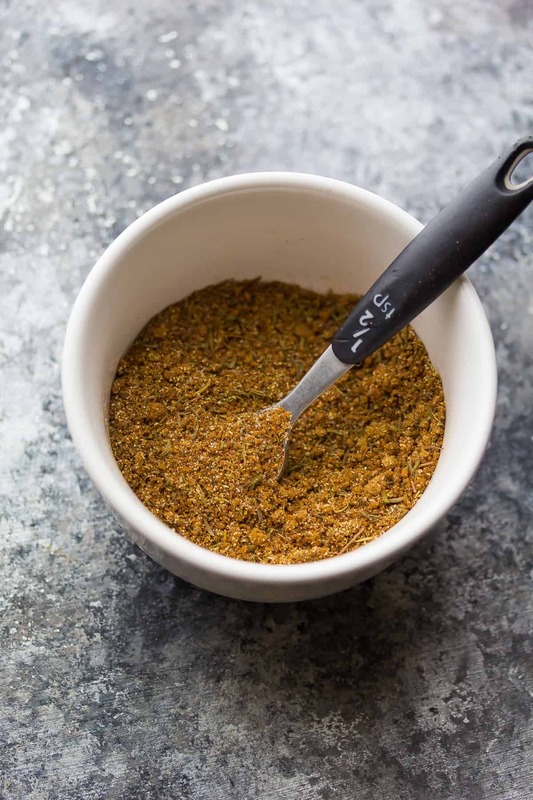 We’re starting this recipe off with a super simple rub filled with delicious Jamaican spices: allspice, nutmeg, thyme, a bit of cinnamon, and as much cayenne as you’d like. You can make it Ben spicy (aka: mouth flaming, tongue hanging out of mouth, sweat on brow spicy), or Denise spicy (aka: just a nice mild heat). Or you can leave it out altogether. 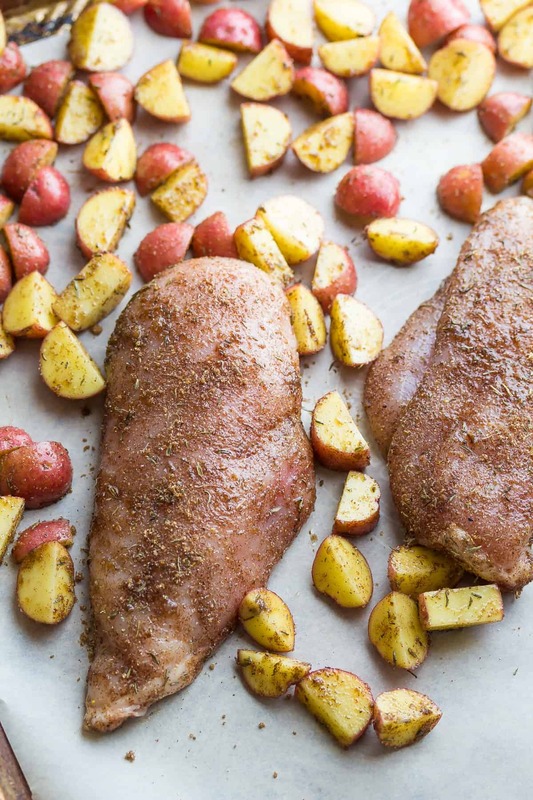 How easy is this sheet pan recipe to make? This Jamaican chicken sheet pan dinner is one seriously easy meal. You toss the chicken in the rub, toss the potatoes in the rub, bake for 10 minutes. Then you toss the veggies in the rub and return to the oven for 15 more minutes. Serve with lime wedges and fresh mango. DON’T SKIP THE MANGO, you hear?! 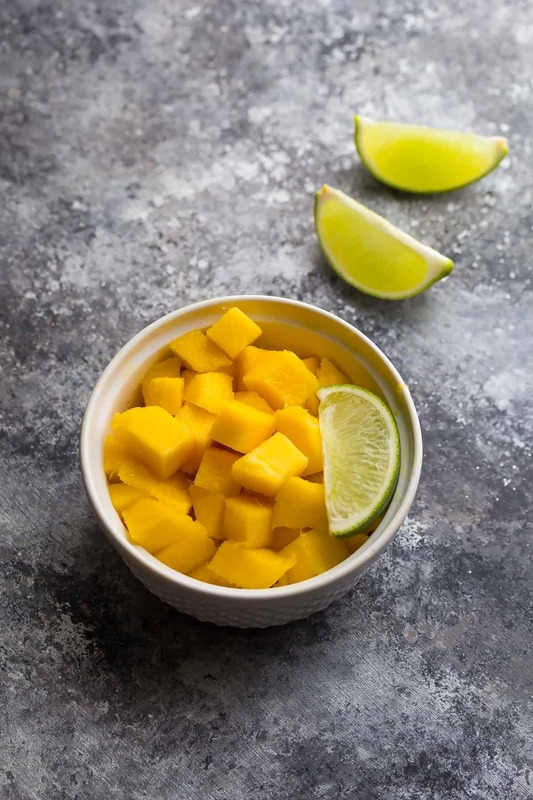 Mango = magic in this recipe. Just not the same without it! More sheet pan dinners for us! looking for more Jamaican recipes? Check out this Jamaican Jerk Seasoning and this Shortcut Jamaican Jerk Chicken Marinade! Heat oven to 425°F. Line two baking sheets with parchment and set aside. Stir together all rub ingredients. In a medium sized bowl, toss the chicken with 1 tablespoon of olive oil and 1.5 tablespoons of the rub. Make sure they are evenly coated, then arrange on one of the baking sheets. In a separate medium sized bowl, toss the potatoes with 1 tablespoon of olive oil and 2 tablespoons of rub. Arrange on the baking sheet around the chicken. Bake for 10 minutes. Flip the chicken and return the pan to the oven for 15 minutes. Toss the peppers, onion and zucchini in 1 tablespoon of olive oil and 2 tablespoons of the rub. Arrange on the second sheet pan and bake for 15 minutes. While sheet pans are cooking, prepare the mango. 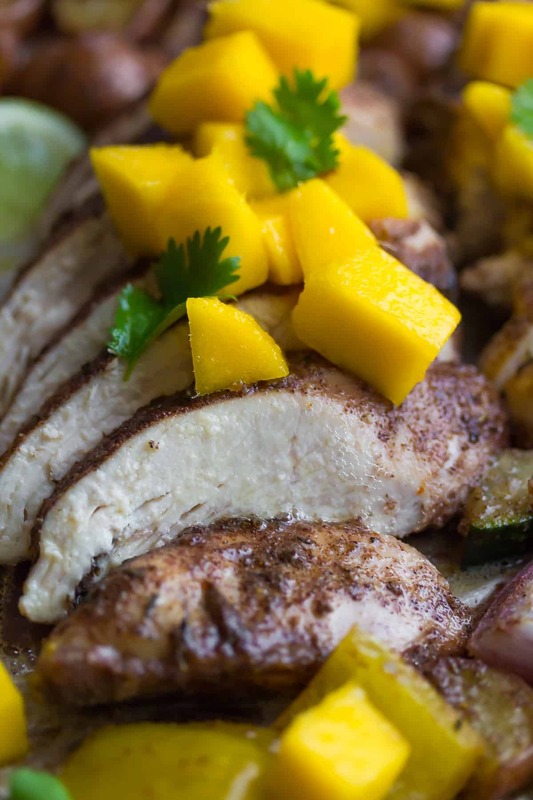 Allow the chicken to rest for 5 minutes before serving with the mango. Leftovers make for an excellent lunch. 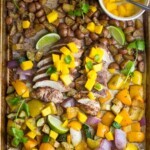 this was featured in a recent foodiecrush sheet pan post, had to check it out since I’ve always loved jerk chicken, but those few times I’ve made it, it didn’t work for one reason or another, so this looks very straightforward and great ingredients, love the mango tip!, so thank you for this recipe! I hope you enjoy it, Sabrina! I made this with lean pork chops last night and it is so delicious! It makes for great lunch leftovers the next day too. Hubby can’t stop raving about it, and we definitely agree that the mango is necessary! Beautiful photos, gorgeous meal, everything’s perfect! Thank you for this easy to follow recipe. Cheers. Oh my goodness that looks amazing! I love mango with chicken, it’s so good. My husband would love it super spicy too – me and the kids, not so much! We’ll have to do a mild version! Happy December Denise! This looks so appealing and delish. I am looking forward to giving it a go real soon. I have a question. My husband wants full-on power flavor in every bite when he eats chicken. So I always split breasts horizontally providing more surface space for the rub, marinade, etc to cling to. How can I adjust the cooking regimen so that they are fully cooked but not dried out?? And are the vegies supposed to be crunchy? 15 minutes sounds like they still have bite. Also, since they all cook at the same temp, have you tried adding the vegies onto the same sheet pan with the chicken and potatoes? After the initial 10 minutes? 1 pan, less cleanup. 1) I have never cooked split chicken breasts before (but that’s a great idea for even more flavor). According to this site, you would still cook them for 12 minutes per side. 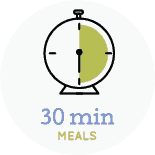 I think I’d check them starting at 15 minutes though, because there’s nothing worse than overcooked chicken breast. 2) The veggies are soft, but still have some bite to them. 15 minutes at 425 cooks them through so they won’t be crunchy! 3) Absolutely you can add the veggies to the pan with the chicken/potatoes. That’s actually what I did in the post above, I did a half batch of the veggies and cooked everything on the one pan. It makes clean up SO easy! I can only eat so many sweet things before I need a week off from sugar! I’ve been wanting to do more sheetpan dinners and I love all the yummy things you have in this one! They look so easy and convenient! Hooray for sheet pan dinners and a break from all things pepperminty and gingerbread-y! I’m in need of some bright and fresh flavors too, I don’t do well with the dark and dreary cold. Love the spices on this chicken! Sounds like a meal time winner to me. BEAUTIFUL-sounding dinner, Denise, and I totally agree with having a break from the Christmas treats. We still need to eat dinner this time of year, after all! Love how your recipes are always so easy and healthy. Lovely idea!